Is this the world's strangest necklace-headset hybrid? An interesting but odd offering from Huawei that might just prove to be a bit of a hit if the running crowd gets on board. 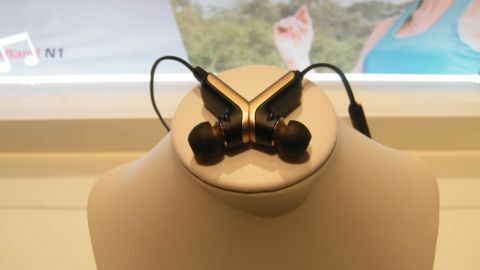 If you've ever looked at a pair of headphones and wondered if you could turn them into a hipster necklace if only they were stuck together somehow, then boy does Huawei have the alternative headset for you. For everyone else, it might take a bit of time to adjust to the fascinatingly bonkers Huawei Talkband N1, a bluetooth headset/wireless microphone/fitness accessory that can live around your neck in its downtime. A simple wire between the two chunky but not unattractive headphones means that when you are not using them you can stick them together with magnets in the earpieces and turn them into a necklace that looks amazingly like two chunky (but not unattractive) headphones stuck together with magnets. Okay, so you've rumbled us - we think the style conceit is a little silly, but it could prove surprisingly functional for those people who have finished their run and need their hearing back but don't have a pocket in their spandex outfit. And for those that want bluetooth in-ear headphones but are scared of losing them then a necklace is also not the world's worst idea. We couldn't try any actual sound with the headsets, not least because a press showcase in Barcelona is not the most sanitary of places, but Huawei are confident that the E117 pricetag has allowed them to give you something that sounds comparable to the likes of Sennheiser. Continuing the exercise theme, the Talkband N1 is IP5-level water and dust proof (ie don't swim or take on a sandstorm in them) and should keep that troublesome sweat from damaging it. Stats-wise, there's a purported 4.5 hours of talk time or 7 hours of music - which can be kept in the 4GB of onboard storage. It will take two hours to fully charge and has noise reduction for both the mic and the headphones. Last, but not least it comes in three colours silver, gold or (a very pinkish) red - so when you are looking for your necklace you can match to your heels. Or something. Host and former Blue Peter TV show presenter Zoe Salmon told us she thought the Talkband N1 was 'the new diamonds' which we hope is a joke and certainly justified her salary, but this is an interesting and novel new offering from a company that's showing a promising glint of innovation. Just make sure you wipe off the earwax before you start sporting it as a necklace.